Telephone Story: A Portrait, is a sound and video self-portrait of artist JD Beltran which I collaborated on making for the 2007 Cleveland IngenuityFest. Her concept was that of a self-portrait as told inferentially through telephone messages I had received and saved over the last several years. By listening to her messages, the viewer could glean much about my life and relationships, and hence, about me. The interface was a large glass wall, approximately 6' x 6,' behind which was rear projected video. The wall was fitted with special sensors to detect frequencies of knocking or tapping. The interface image featured a close-up of her desk placed in front of shelves of her books; on the desk were her tools, her laptop computer, and photos and correspondence from her mother. Objects within this interface were subtly animated, and each object represented a personal relationship or set of relationships. When the viewer knocked or tapped on an object, the object would appear to dissolve and then fade to black, and a set of telephone messages would begin playing along with a companion video. For example, knocking or tapping on letters from her mother would bring up a set of telephone messages that she had received from her, along with video complementing the audio. 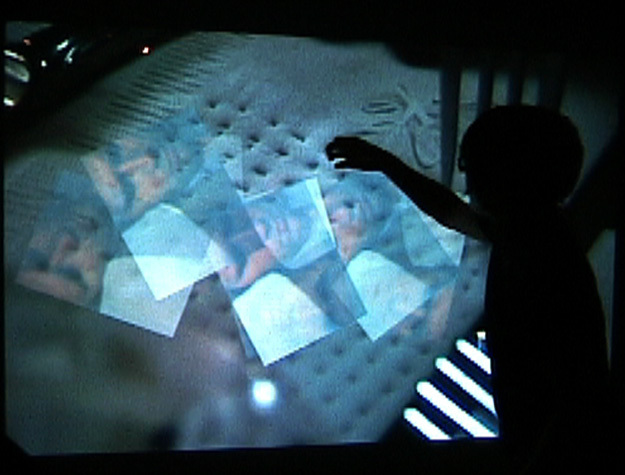 While the video/audio played, the viewer could continue interacting with the surface. If they tapped or knocked, an image of the person speaking would suddenly appear at the spot where they tapped - the image would spin slowly, then float off and disappear. Knocking harder would make the image spin faster, and banging the wall with a fist would bring up an array of images of the person, which would disappear after a few moments. After the message/video ended, the image would fade to black and the desk interface reappeared. This interactive artwork was awarded a Silver award in the Interactive Design category by I.D. Magazine. Tilty Tables were further innovated with the "Twisty Table" which instruments torque on the table. For the TerraLink Gallery at the Maryland Science Center, Onomy Labs created the first Twisty Table to allow visitors to explore very large high resolution satellite images in detail. Like our classic Tilty Table, tilting the table top allows the visitor to scroll around an image. The addition of an instrumented twist enables the visitor to zoom in to see much more detail, or to zoom out and get a sense of the whole. The next innovation on the Tilty Table was the Spinny Table. Like the Twisty, the spinny instruments another degree of freedom, typically used to zoom in and out of a representation. In the case of the Spinny table, the tabletop onto which the image is projected actually spins. Spinny Tables have proven to be the most intuitive mechanism for zooming, and are particularly good for unattended settings. One of the most popular applications to run on a Spinny Table is the GeoConnecTable, which is sort of like Google Maps, but with a good UI for group settings. People love poking around for their homes and for famous landmarks with this intuitive whole-body interface.